That’s what most people said when they walked into my friend’s craft shop and saw the stained-glass barn he was making as a Christmas present to my dad. 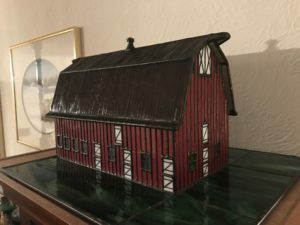 The replica looks just like Daddy’s barn. And he was thrilled with the gift, just as I’m thankful to now have it in my home to remind me of both Daddy and Mom. Treasured childhood memories are hidden there. Enjoying the view from the loft. Breathing in the aroma of freshly baled hay. Helping Daddy when he milked the cows. Bottle feeding the calves. 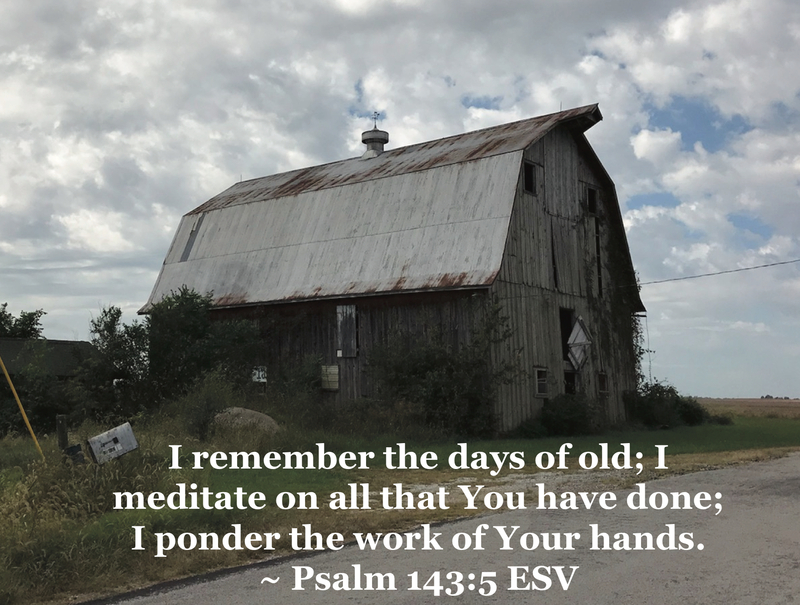 Then there were the times when I bedded down the cows by spreading fresh straw in the loafing shed—the area of the barn where the cows slept. I’d stare down at them from the loft. They’d stare up at me, waiting for me to toss the bales down so they could buck and kick and toss and scatter the straw all over the loafing shed. How much fun they had. And I didn’t have to spread the straw. Just a few weeks ago, during harvest time, I drove to the farm, which I’m thankful to still own. The weather-beaten barn still stands, but I often wonder at what point in time the wind will finally blow it down. Until then, I take in the view and remember, giving God thanks for all the memories that I hold in my heart of Bud’s (and Marie’s) barn. Including the promise of seeing my parents again in heaven because of their faith in our Lord and Savior, Jesus Christ. A Veteran’s Day note: Memories of my dad always include how much he loved our country and how proud he was to serve in WWII in the Coast Guard. May we all take time this Veteran’s Day to say “thank you” to those who have sacrificed so much to keep us free. May God bless them all and may God bless America. I can always count on a devotion from Linda which combines wisdom from the Scriptures and real life experiences for inspiration. Isn’t that the truth? She’s the best! Thanks for your note, Judy. Have a blessed Thanksgiving.